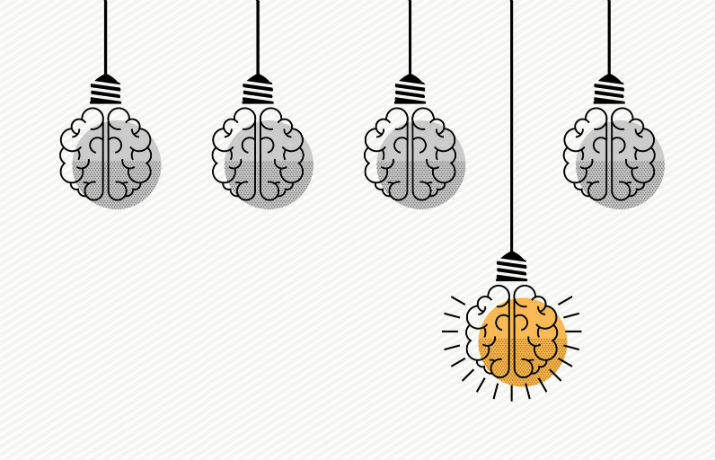 Psychometric Tests: Are They Beneficial to Recruitment? Home All Articles Psychometric Tests: Are They Beneficial to Recruitment? Quick question; do you use psychometric testing when recruiting? Yes? 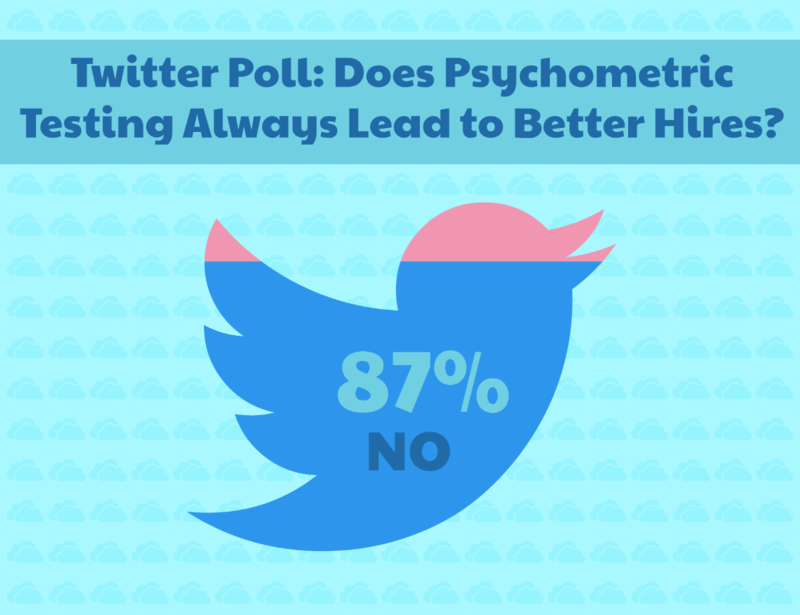 Well, have you ever stopped to think WHY you use psychometric testing when recruiting? Although the recruitment process has always relied heavily on CVs and job interviews, aptitude and personality tests have remained just as ever-present amongst three-quarters of employers. In case you've been a little slow on the uptake, we've compiled a simple guide to psychometric testing and whether or not it can have a positive impact on your hiring decisions. Despite the sophisticated moniker, 'psychometric testing' is simply used to measure the potential behaviours of an individual. Okay, so it's a little more complex than seeing whether someone will play nicely or not, but really, it's not so far away. When looking to hire staff, employers will use psychometric testing as a technique to distinguish the mental traits of a job applicant - pertaining to both cognitive ability and personality. In doing this, businesses hope to recruit staff who not only have the right skills for the role, but will also be the right fit for the company culture. So basically: Can this person analyse large amounts of data? Is this person going to work well in a team? Although they've only been used in mainstream recruitment for the last 100 years or so, the concept of identifying different personalities dates back to the 5th century BC, notably, the Four Temperaments. Despite this, it wasn't until the 1800s when the term 'mental tests' was coined by Francis Galton, with Spearman, Binet and Jung all bringing their own ideas to the party over the following centuries. Today, there are many different types of psychometric tests that are widely used, all designed with the similar goal of looking beyond employment history and academic achievements. Aptitude tests are used to measure the intelligence of a person. These are closely related to IQ tests and generally involve candidates answering a series of multiple choice questions relating to logic and reasoning. When setting aptitude tests, employers and recruiters are looking to evaluate two types of intelligence: fluid and crystallised. Fluid intelligence is often thought of as 'street smarts' and relates to abstract problem solving and strategic thinking. Put simply, how good are you at thinking outside of the box and / or thinking on your feet? Crystallised intelligence, on the other hand, denotes your ability to apply knowledge and experience to completing tasks. Are you good at retrieving relevant information from your memory? Can you work out problems by using learned skills? 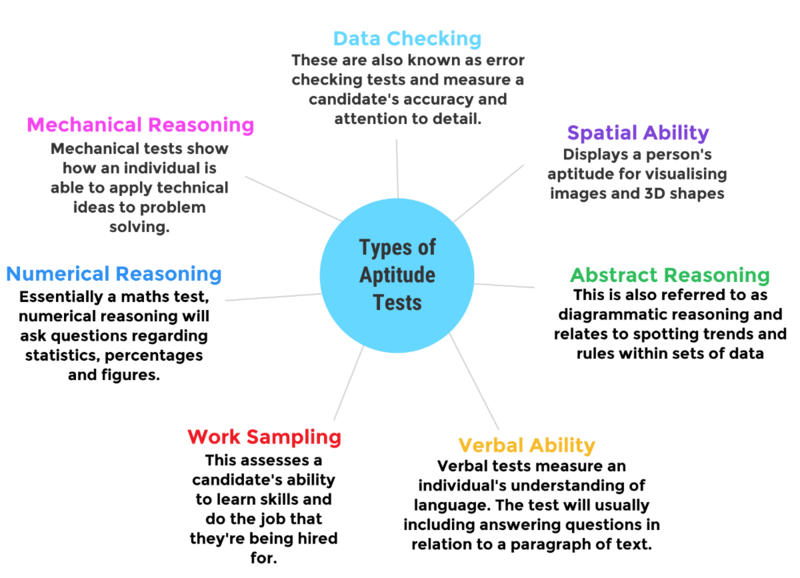 Aptitude testing is more closely related to how well a candidate will perform tasks and can be heavily weighted towards particular aspects, depending on the nature of the job. For example, a financial vacancy may demand a larger emphasis on numerical reasoning and data checking. Exactly as it says on the tin, a personality test assesses your, well, personality! By asking questions in relation to feelings and self-analysis, a personality test will aim to grasp an insight into how an individual behaves in different situations. Do they have leadership qualities that will stand up well to pressure? Or are they more likely to fade into the background when the going gets tough? Personality tests tend to take the form of questionnaires, with multiple choice answers ranging in strength of opinion. As well as discovering how a candidate will react in varying work scenarios, personality testing can also find what makes them tick. A job applicant can have all the communication skills in the world, but it'll mean nothing if they're not motivated. That's why it's just as important that employers try to to identify qualities such as drive and work ethic. The downside of personality testing? They're quite easy to manipulate. Personality tests rely on a certain level of honesty that can't really be guaranteed. For the most part, candidates are able to identify which are the most desirable traits for the job and answer accordingly. Will anyone really admit to responding aggressively to confrontation? Or that they procrastinate when not being micro-managed? These aren't difficult questions to get around, so might not be effective in screening out the dishonest. In many circumstances, this is quite easy to see through and tests will often reword questions to try and mitigate it. Regardless, answers should still be taken with a pinch of salt. Psychometric testing has become a key part of the recruitment process, with nearly three quarters of UK companies (with 50+ employees) using them when hiring. Just what is it about these personality barometers that employers, recruiters and HR leaders value so highly? While CVs and interviews will go someway to painting a picture of an individual, recruiters and employers will often administer a psychometric test to attain a full candidate profile. When seeking work, job applicants will always try and display the best version of themselves, often choosing to hide certain character traits. Now I'm not suggesting that all of these candidates have any skeletons in the closet (some, probably) but they may be aware, for instance, that introversion or an inability to work in team could hold them back from getting the role. This is where psychometric testing comes to the fore. By asking candidates to answer a series of multiple choice questions pertaining to personality quirks, employers hope to be able to uncover characteristics that might not appear until further down the line. While it might not sound like much, the structure that testing can bring to the recruitment process cannot be undervalued. By ensuring that all candidates take the same tests in the same conditions, employers are able to insert a level of standardisation that might be lacking from other features of their hiring activities. CVs, for instance, are carefully calculated and formatted documents that all tend to be much of a muchness. Conversely, job interviews don't allow all types of personalities to 'show off' their skills and typically favour those with a gift for the gab (even if they have a gift for very little else). Psychometric testing eliminates these influential factors and gives candidates a fair chance to compete for the role. Okay, so they aren't being assessed on experience or qualifications, but there's more to a good hire than what they can write on your LinkedIn bio. One of the predominant benefits of psychometric testing is the ability to benchmark candidates. By comparing results, recruiters are able to determine a group average and therefore see which job applicants stand out (or fall behind) for certain skills. Although this won't necessarily decide which candidate is the best for the job, it helps eliminate those that definitely aren't. For example, a management vacancy will require certain leadership skills and a personality test will be able to weed out those that clearly don't display this quality. Not only does this help narrow down the throng, perhaps more importantly: IT SAVES TIME! Recruiting can be a drawn affair, in fact, the average time to hire is 28 days (or a month, depending if you're a glass half full / half empty kind of person). Depending on the candidate response, this can be much longer, especially if you're an SME that doesn't boast the same HR resources as a large PLC. One of the biggest costs of a bad hire is company culture. New personalities always have the potential to 'shake things up,' but psychometric testing is able to minimise much of this prospective damage. While you may be comparing job applicants against each other, you should also be comparing them against your current employees. You don't need us to tell you that personalities can clash and this can be a problem for businesses - especially SMEs. 75% of the Times top 100 companies use psychometric testing as part of their recruitment process, perhaps proving that it is still regarded as key to any good appointment. Although there are no guarantees in recruiting, personality tests increase the chances of employers bringing in staff who are similar to their existing workforce. Additionally, while it's great to find candidates that you know are going to fit in, your business might be lacking in certain attributes. Perhaps you're crying out for someone with clear management prowess? Or a hire that will bring some variation to the office. Do psychometric tests lead to good hires? When used to complement a wider recruitment strategy, psychometric tests can help employers make informed hiring decisions. As a sole component though? The jury's still out. Since the turn of the decade, personality profiling has come under increased scrutiny thanks to a series of negative stories in the press. In 2014, it was revealed that the Co-op Bank had recruited a new chairman based largely on psychometric testing. Despite having almost zero financial experience, the now rather infamous Paul Flowers, was hired by the Co-op due to excellent leadership scores. He was later forced to resign after a miscalculation of assets resulted in a £1.5bn hole in the company. Okay, so psychometric test scores can't guarantee perfect hires, but their popularity suggests that employers still have some confidence in the results. In fact, 75% of the Times top 100 companies use psychometric testing as part of their recruitment process, perhaps proving that it is still regarded as key to any good appointment. Additionally, 95% of FTSE 100 companies also use psychometric testing when recruiting, as do the military, NHS and local authorities. But why do they persist? "It is not enough to just understand somebody's technical skills or the depth of their experience; you need to ask fundamental questions like "Will this person fit into my business?" "Will they fit well into our culture?" "Will their attitudes and beliefs resonate within our organisation?" Once you know the answers, you have a rich source of information to make a wise decision." The short answer here then, is security. By adding another barrier to the process, employers are in turn adding another level of protection against the wrong appointment. CVs, Applicant Tracking Systems (ATS) and whatever line of questioning you throw up in an interview are all valuable in any hiring campaign, but they don't necessarily tell the whole story. This is where psychometric testing comes in, hopefully providing a little more peace of mind when taking candidates through to the final stage. Psychometric testing (which many of the agencies on our site offer!) can help employers make informed recruitment decisions. We all know that choosing the right candidate can be tricky, let alone time consuming, but aptitude / personality comparisons can help preserve the sand in the hour glass and simplify your options. I suppose the biggest takeaway from this article though, is not to rely too heavily on the test scores. Sure, they can filter out some of the most unsuitable applicants (mostly), but they'll never be able to pick the candidate for you. That's where a considered recruitment strategy is needed, when, combined with psychometric scores, employers are able to identify the best candidates for their business.